The Tacklife paint sprayers are reputedly manufactured with a mission to produce products that inspire and enable their customers to live a better life . Tacklife prioritizes the quality of its products over the quantity it produces. The company has a variety of products which includes Automotive Tools, Lawn & Garden tools, Home Appliances among others. The company has a variety of paint sprayers, which are popularly demanded in several countries of the world. Tacklife spray guns are manufactured in accordance with industry best practices which guarantees durability and a reliable performance. In addition to this, all their paint sprayers come with a warranty to ensure that you receive value for money. Feel free to browse through the list of our picks of the best Tacklife paint sprayers on the market. 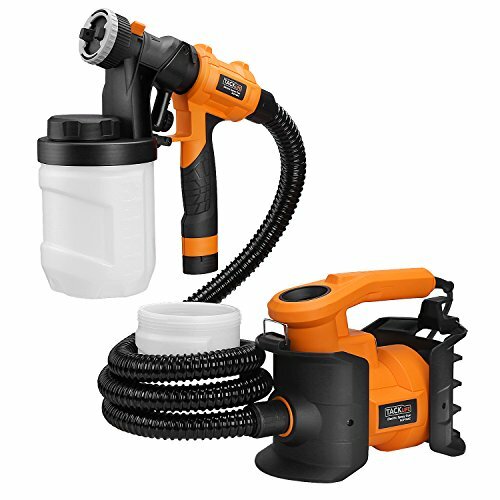 The SGP15AC Sprayer is an affordable tool from Tacklife made of ABS plastic and designed to enable homeowners to tackle small household projects. 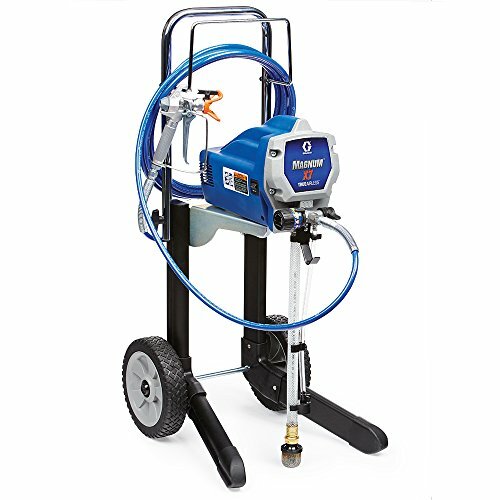 This sprayer is a suitable choice for painting car parts, steel furniture, home appliance parts, and wooden products. Despite being made from plastic, it is still a durable and versatile product for any homeowner. 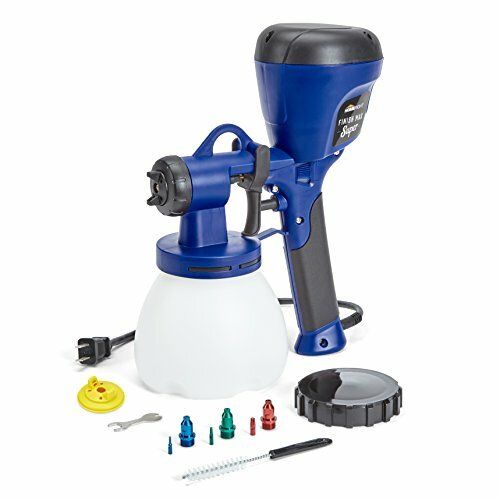 It comes with a detachable 900 ml canister to allow for faster-refilling and easier use of the paint materials. Most parts of the spray gun are removable and hence can be cleaned with ease. The canister works well with free-flowing thin paints & stains and can be refilled and cleaned without necessarily removing it from the unit. The machine comprises a spray gun, funnel, detachable canister, a set of gaskets, cleaning brush & needle, a user manual, and three spray nozzles. It is one of the newest models on the market and it comes with a 24-month warranty. 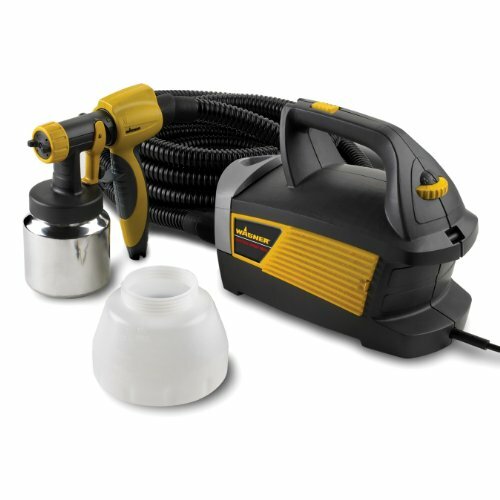 This sprayer produces a professional finish for your lawn furniture and decks with its outdoor air turbine. The turbine enables a continuous flow of air and paint materials to achieve extra-fine atomization of the paint material. This enables a more uniform coverage while reducing wastage at the same time with the help of an air jacket. 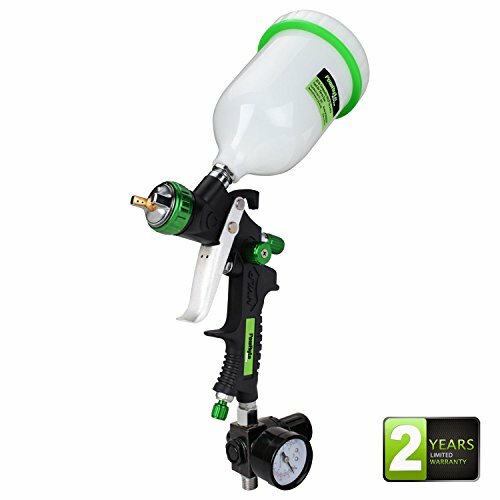 This sprayer includes three nozzles and uses three spray patterns to give you the maximum versatility required in a painting project. The three nozzle sizes are 2.0 mm, 2.5 mm, and 3.0 mm. A detachable valve knob is there to help you control the paint material’s flow rate. These knobs also help in securing precise paint application. You can measure the viscosity of your paint material using the funnel. This helps in controlling the coating speed by adjusting the flow rate to conform to the type of project you are handling. Since it sprays paint in a uniform way and doesn’t leave any brush marks, this machine can be used for precision-oriented painting applications. An integrated, easy to understand, and clear painting spray tip and techniques are included to enable you to choose the different patterns of spraying. By simply rotating the spray-tip, you are able to adjust it for round flat jet, horizontal flat jet, and vertical flat jet. There is also a width lever and a variable trigger to enable you to handle both small and large projects by controlling the flow rate and adjusting the paint output. The Tacklife SGP16AC spray gun is specially designed for professional painters and homeowners to handle tasks related to home appliance parts, car parts, wooden products, and steel furniture. 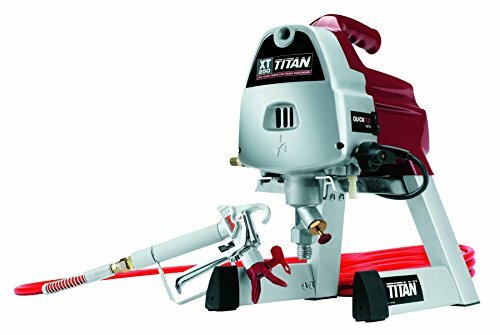 It has features such as a 6.5-amp powerful motor, three spray patterns, two detachable containers, three copper nozzles, adjustable valve knob, and a 1.8M air hose. Its powerful motor produces up to 800W which is enough power to handle a variety of applications. It provides spraying capabilities of 110 DIN per minute and a spraying flow of up to 1100 ml per minute. It has one of the best spray gun distances measuring between 35 and 45 cm. Its portable design packs a number of accessories. One such accessory is the three copper nozzles of sizes 1.0 mm, 2.0 mm and 2.5 mm. The nozzles combine with the two copper tips to make atomized particles more refined. A soft rubber handle is included to enhance your grip feeling while the separation of the motor and then gun reduces its weight. The air hose of 1.8M is long enough to meet a number of distance requirements. 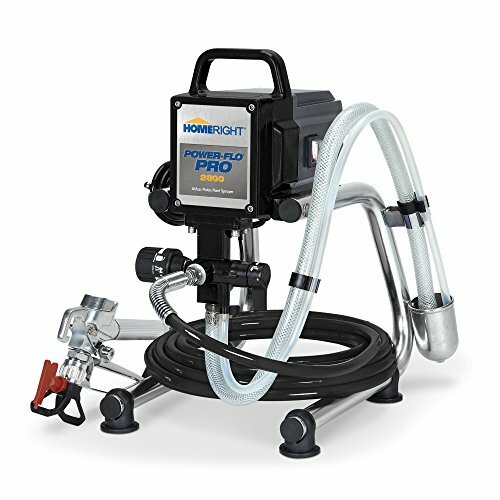 The paint sprayer is under $100 and you can easily work with it in different environments because of its dust proof capabilities and shoulder straps. The adjustable valve knobs come with a spray width lever to enable you to adjust the flow rate and the coating speed for precise application of paint. the lever switch can also be used to adjust the spraying width to suit different spraying applications. The detachment of the canisters allows for direct adding of the paint. Cleaning this unit has also been made convenient by having all the machine parts removable. A container of capacity 1200 ml can be opened without removing it from the machine and paint added to it to give you a continuous painting experience. The funnel helps in measuring the paint viscosity to enable you to control its smoothness. A 5.9-feet power line is included in the package alongside a user manual to help you in setting up the machine. 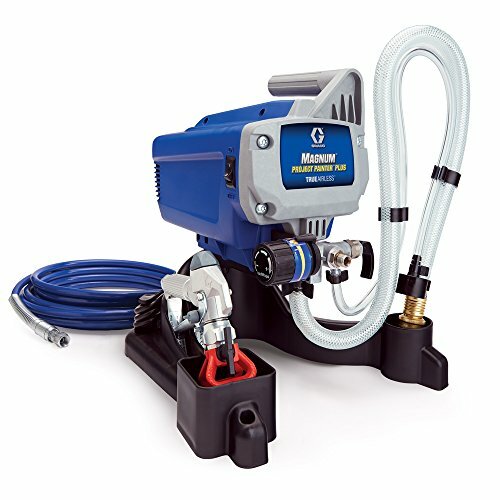 Just like the SGP15AC spray gun, a warranty card and a 24-month warranty period are provided for this sprayer. 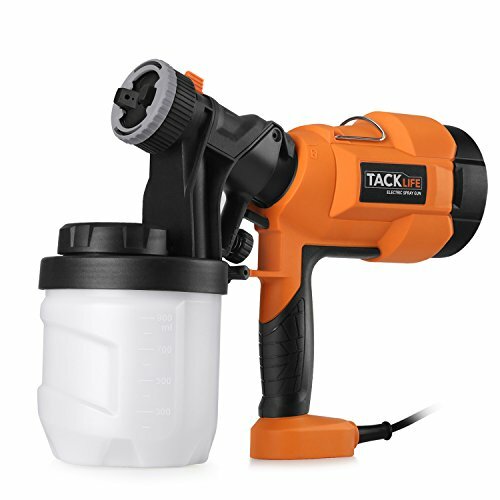 This is an 8.5-amp sprayer unit from Tacklife that lies under the list of most premier handheld paint sprayers that offers efficient spraying power for use at home or the work-related environment. It features a three-spray pattern for circular. horizontal, and vertical jets. This combines with two copper tips and three copper nozzles to give you the necessary accessories needed for fine finishes. It has a portable design which features anti-skid soft rubber handle, motor & gun body separation, and air hose storage slot. 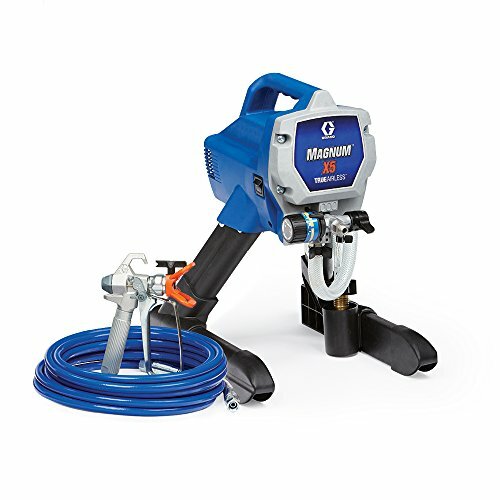 The rubber handle allows for enhanced grip feeling while the motor/gun separation allows enables reduction of the unit’s weight at the same time you are able to save time while using paint spray gun. The length of the air hose is 3.5M which is sufficient enough to cover various distances. There is also a retractable handle and a universal wheel to enable easier maneuverability with this machine. Its motor provides a spraying power of 150 DIN per minute and a spraying flow of up to 1100 ml/min. This is sufficient power for handling a number of applications involving home appliances, car parts, wooden products and steel furniture. The machine has adjustable valve knobs that can be used to adjust the flow rate for precise application of paint. The coating speed can also be adjusted to enable even coating and eliminate the issue of brush marks. There is a spray width lever which helps in adjusting the spraying width to suit different applications. All its parts can be removed to allow for convenient cleaning while its detachable canister eases the addition of paint. The canister also has a cover which can be opened for the purpose of adding paint. There is a funnel that can be used to control the paint smoothness and measure its viscosity. Its other features include a cleaning brush & needle, 5.9 feet powerline, spray tip key, and a 24-month full warranty. These features ensure efficient spraying and long-lasting use of this sprayer. The Tacklife is a reputable brand that makes high-quality and durable paint sprayers. Their sprayers are packed with fantastic features, such as the tilt technology that allows you to spray from any angle. Therefore, Tacklife spray guns are ideal both for large and small projects. Additionally, their products are reasonably priced and should fit any budget. Below you can read about the main features and what to consider if you decide to go for a Tacklife spray gun. 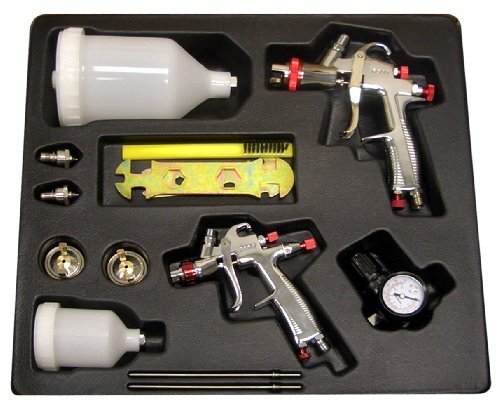 One of the benefits of acquiring Tacklife Spray Guns is that they come with an adjustable spray mechanism which allows a painter to customize each painting project. Tacklife products typically feature three spray patterns which are horizontal, vertical and circular. All Tacklife spray guns come with three copper nozzle sizes which allows a painter to choose between different ways to dispense paint. 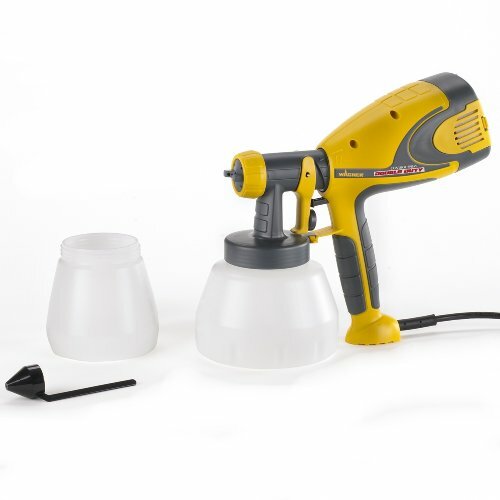 Tacklife Paint Sprayers also feature adjustable valve knobs which allows a painter to adjust the flow rate and the volume of paint dispensed to fit the needs of each and every painting project. This feature makesTacklife Paint Sprayers highly versatile as they can be used for a variety of painting projects. Moreover, this feature ensures that their paint sprayers can spray paint evenly. It is also worthy of note that Tacklife Paint Sprayers are portable and lightweight for efficient performance. Furthermore, they can be used for a variety of painting projects especially car painting projects. The design and lightweight ensures that they are highly maneuverable and can reach every impossible-to-reach place. This guarantees that Tacklife products are ideal for spray painting home appliance parts and furniture. All parts of the Tacklife Paint Sprayers are easy to remove which allows for easy and effortless cleaning. Moreover, it also makes Tacklife products easy to setup and maintain. This feature is also beneficial during large scale painting projects as you can easily remove the paint canister for refilling. Another impressive feature of Tacklife Paint Sprayers is that they come with a very long power line which ensures that they can be easily used to cover long distances in a large scale outdoor painting project. Tacklife Paint Sprayers come with a 8.5 Amp motor which greatly optimizes their performance and capability. As a result of their powerful motor, Tacklife Paint Sprayers offer great painting speeds and the capability to atomize paint completely in order to produce a fine and smooth finish. A common feature of Tacklife Paint Sprayers is their huge paint canister. This ensures that they can accommodate a substantial quantity of paint and can be operated for a long period of time without refilling. This reduces the stress of large scale painting projects. Tacklife Paint Sprayers stand out among the competition for their Energy Star rating. That way, you can significantly cut down on your utility bill and therefore, safe money long term. This makes Tacklife products the ideal paint sprayers for large scale painting projects. Tacklife Paint Sprayers come with long paint hoses which provides adequate space for effective spray painting. This feature optimizes their effectiveness during outdoor painting projects. Tacklife stands by their products and to ensure a hassle-free painting experience all Tacklife sprayers come with a 24 months warranty which ensures that you receive value for your buck. Tacklife Paint Sprayers are durably constructed and have a reliable operation. One of the several reasons to invest in these brand of Paint Sprayers is their Energy Star rating. Very few brands have the Energy Star Certification, this makes Tacklife Paint Sprayers ideal for commercial use. Furthermore, their products are very versatile and can be used for a variety of painting projects. Moreover, the company’s 24 months warranty policy is something you should take into the equation. On top of that, replacement parts for their products are readily available and are easily accessible.